Hide 416 comments... Click to show. Please stop spamming your profile , and if you wanna post videos do it in the video section instead. try and keep the answers to more than 2 words. if someone asks whats the best weapon give a short description why. answering a question every 7 seconds isn't gonna get you very far. Your warnings are getting thick now. Please post video links on the video section and use the embed code. Thanks. you've made my poop list. I already had points taken away from me. It was a site glitch that duplicated content. I hope you enjoy your ban. FanCoins Leaderboard Congratulations to Week 3 winners: 1st $50 Applecore, 2nd $25 Glorum and 3rd $15 xTcK. The coins count has started over again so anyone can win. See Week 3 Top 10. PLEASE READ POST ABOUT NEW CONTENT GUIDELINES. We would like to see some REAL strategy guides & articles. 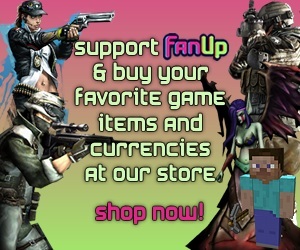 Submit your post URL to community@fanup.com and we will award up to 500 bonus FanCoins for each.